A move to grant women in Sri Lanka the same rights as men to buy alcohol legally has been overruled by President Maithripala Sirisena. The government announced on Wednesday it was amending a 1955 law, agreeing that it discriminated against women. "This is not just about this archaic sexist law but the archaic sexist system in which this law is just one more tool of control," wrote one Sri Lankan blogger. What would the reform have meant? Why did the president step in? Leading monks in the Buddhist-majority country had criticised the decision to lift the ban, arguing it would destroy Sri Lankan family culture by getting more women addicted to alcohol. Saying he had listened to criticism of the government's step, President Sirisena told the rally he had ordered the government to withdraw its notification announcing the lifting of the ban. It came as no surprise to some as he runs an anti-alcohol campaign and has warned in the past that alcohol consumption among Sri Lankan women is increasing "drastically". However, commentators say the abrupt cancellation of the government's reform suggests there are differences within the coalition government. Why is the president being accused of hypocrisy? Mr Sirisena has encouraged women in the country to play a more active part in politics, boasting last year that his government had acted to ensure more women were returned at future elections. 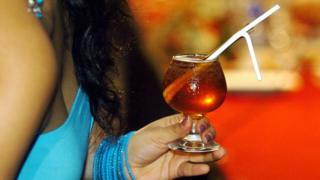 Just how much do women drink in Sri Lanka anyway? According to World Heath Organization data from 2014, 80.5% of women never drink, compared to 56.9% of men. A majority of women in Sri Lanka traditionally choose not to drink alcohol as they see it as contrary to Sri Lankan culture, the BBC's Azzam Ameen reports.